Home → Internet → Is Yahoo Advertising Search Result and PPC Advertisements via Outbrain? I was on CNN.com earlier today and saw an ad which interested me. 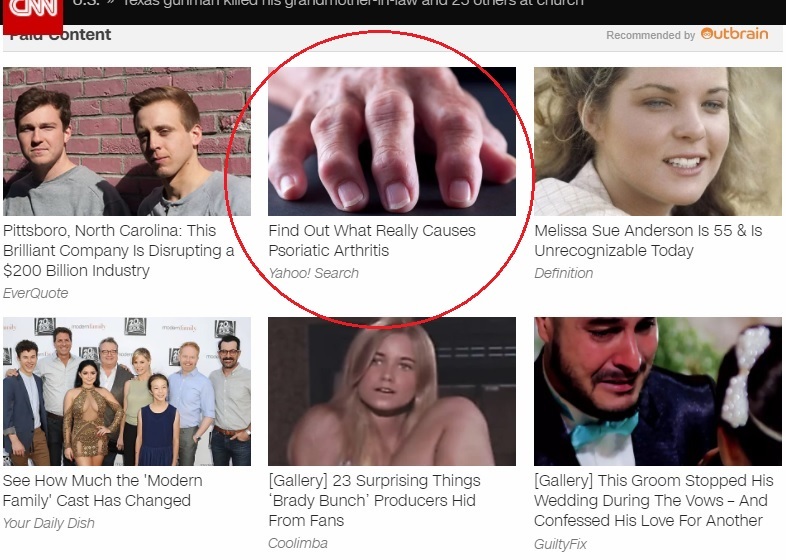 No, thankfully I do not have psoriatic arthritis, I was just curious about the ad as I’ve been studying misleading ads lately. So I clicked it. I was surprised to see a search engine result page by Yahoo. 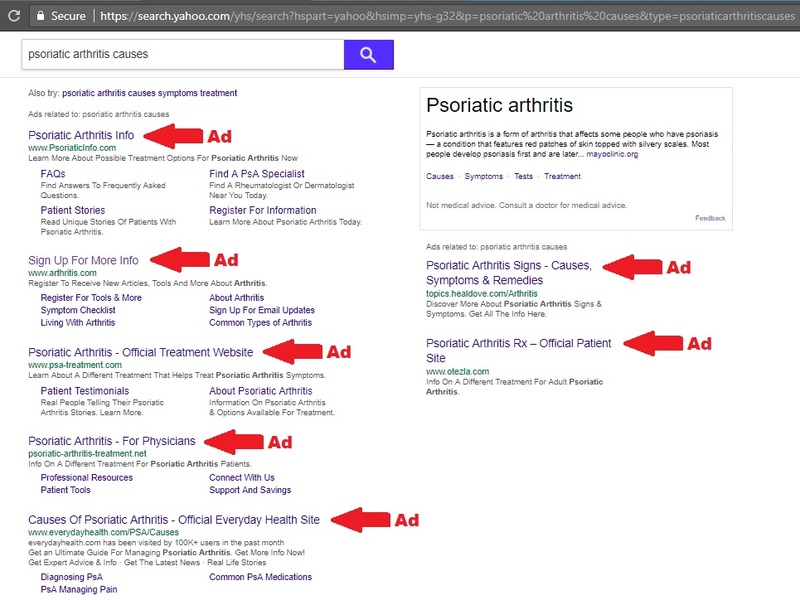 Over at Google you can expect to see an ad but then you will also see relevant search results, especially for important medical conditions. At Google, the causes of psoriatic arthritis are readily available from Mayo Clinic, the Arthritis Foundation and WebMD. I went ahead and clicked on the top Yahoo ad which looked like spam. This one was called “PsoriaticInfo.com”. What loaded was a Humira website. Of course, this is a website for Humira. Apparently Humira is an arthritis medication. I didn’t read their page but I did glance through it and it is what I would personally consider a typical sales page – it is nice and pretty and has a customer review then goes on to talk about the joint damage lots of people get if they have psoriatric arthritis. I have no clue if this is a good medication or not- could be the best thing since sliced bread, I don’t know. Is this profitable for Yahoo? I wonder what Humira pays for an ad on Yahoo. Is Yahoo making money by getting people to click their ads on publisher websites such as news sites like CNN, then presenting people with their own ads which cost more? I’m sure that is perfectly legal and fine and dandy it is just something I haven’t seen on the Internet in a long time. Nor have I seen so many ads on a page in quite some time. In fact, some search engines penalize sites for having this many ads “above the fold” as they say it leads to a “negative user experience”. What do you think about this method of advertising? Do companies know Yahoo does this? Do you think there are too many ads on Yahoo pages? Not enough? Just right?